1. Measure and record plant height. 2. 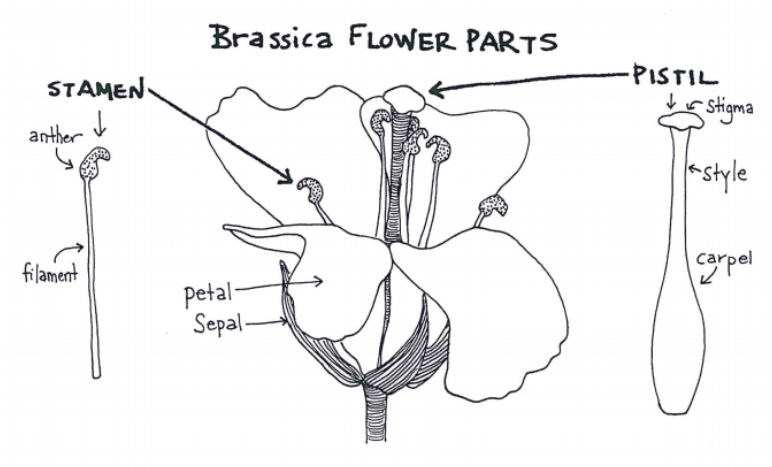 Make 2-3 detailed observational drawings (e.g., a whole plant, a close-up of the new flower buds, the largest leaf, etc). 3. Support wiggly (unstable) plants with wooden plant stakes placed into the soil at angles so as not to harm the main root(s) of your plants. 4. Continue work on your answers to the PPP Chapter 2 questions. 5 . Find all of the vocabulary words (in bold) in Chapters 1 & 2 of the Power Plant Packet (or PPP), transfer them to page 29, and then define them using the SCIENCEsEDiment Glossary. Homework: This week’s Friday reading quiz will be on the 5 most important ideas found in Chapter 2 of the Power Plant Packet (or PPP). Therefore, students can use tonight to begin preparing for this quiz. 2. Make 2-3 ‘discovery’ observational drawings, in other words, drawings that results from the thought or statement, “Wow, I didn’t realize…” or “I had no idea that a plant…”). 3. Support wiggly (unstable) plants by fastening them with green wire ties to wooden stakes. 4. Be sure that the Chapter 1 (PPP) questions AND (bolded) vocabulary terms are completed. 5. Chapter 2 (PPP) questions AND (bolded) vocabulary terms are due on Thursday, January 31st. 6. If time, inspect the substance(s) growing on the top layer of your soil with the binocular microscopes and add observations/drawings to your lab notebook. Homework: This week’s Friday reading quiz will be on the 5 most important ideas found in Chapter 2 of the Power Plant Packet (or PPP). Students can use tonight to prepare for this quiz. Today in science: The two main themes for this lesson were driven by two questions: 1) “What is food for plants?” and “How can I better prepare for my reading quizzes?” After checking in student work in the Power Plant Packet (or PPP) for Chapters 1 & 2 (including vocabulary words), Dr. M showed students how to use the subtitle of Chapter 2 to create a 2-page study guide that would help them have greater success on tomorrow’s reading quiz. Students can see this study guide in the Notes Portal, which has screenshots of the work Dr. M did with students in class on the whiteboard. Today in science: The two main themes for this lesson were “flowers” and “pollination.” After taking the Week 3 Reading Quiz (About food), Dr. M introduced students to the topic of pollination by projecting the diagram below onto the whiteboard and showing students how bees pollinate flowers. It was then announced that students would need to imitate bees today in class–with the help of white, fuzzy, pipe cleaners which mimic the bees hairy bodies!–to collect pollen from other students’ flowers and carefully bring it back to their own. 2. Make 2 drawings in the lab notebook–one unopened flower and one opened flower. 3. Flower pollination rules: be gentle, ask permission, be thorough. Homework: Unless a student has been told otherwise during a personal meeting with Dr. M in class on Friday, February 1st, there is no science homework during the long weekend.